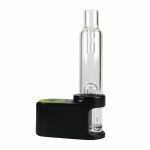 The Water Filtertration not only filters your vapor, but cools and moisturizes as well. These water filters work by enabling the vapor to pass through a small reservoir of water which helps to filter out any small particles that may have passed through the screen, while cooling the vapor down drastically. This makes riding the wave that much more light on both your throat and lungs.